Open Air 0302. Jane Siberry. No Borders Here. 1984 LP includes Mimi on the Beach, Symmetry, The Waitress, I Muse Aloud, Dancing Class. Canadian folk singer, now known as Issa. Co-produced by Jon Goldsmith, Kerry Crawford, and Jane Siberry. 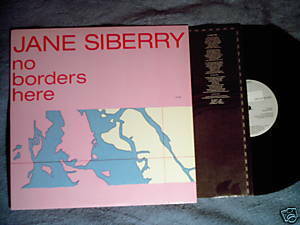 VInyl is VG; cover is VG with photo, illustrations, and minor corner wear; inner sleeve has lyrics.